"Now day and night sit balanced. on canvas, 68" x 48"
media on canvas, 16" x 20"
"In the Zone: A Juried Exhibition of Regional Artists" has occupied two large gallery spaces at the Brattleboro Museum & Art Center (BMAC) since opening for the season last April. The call for entries resulted in 2,400 images from over 400 artists within a 75-mile radius of Brattleboro. Juror Bridget Moore, director of the DC Moore Gallery in New York City, had a challenging time narrowing down the field to works by only eleven artists with basically two modes of working: "Bold, full-bodied gestures characterize one group while intimate accumulations of images resulting in installations distinguish the second," says the BMAC's November-February brochure. Some of the most insightful writing about art comes from its creators.Artist statements from the eleven finalists are presented below along with samples of their work. 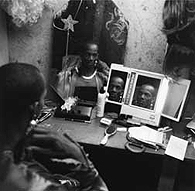 The BMAC 2005-06 season ends on February 5; be sure to explore "The Zone" before this exhibit comes to a close. 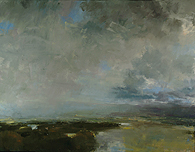 ERIC AHO, Saxtons River, Vermont: The views I paint over the Connecticut River Valley offer me a daily opportunity for personal reflection as I look west from my childhood home of New Hampshire to what is now my adult home in Vermont. The paintings are my direct responses to what is in front of me on any given day. My concerns for temperature, space, fleetingness of atmosphere, shifting light, and references to other paintings, all play a role in the process of building the painting. TIM ALLEN, Putney, Vermont: Considerations of scale in my work are often driven by my hope that viewers experience a sense of intimacy, feeling a part of, rather than merely observing, the scenes I create. I am intrigued by the relationship and interplay between the positive and negative, and by the subtleties and variations of atmospheric light. The Vermont landscape has become an endless source of inspiration to me. OLIVIA BERNARD, Leverett, Massachusetts: My work as an artist derives from the experience of living in a body, and from direct contact with nature in wilderness. The sculptures I make refer to the human form, animal and plant forms, or speak of the materials or features of the earth. They comment on the world of sensation, function, physical urgency, tension, vulnerability, and pleasure, which is life at a physical level. I strive to join the edges of what is transient, ethereal, beautiful, with what is dangerous, grievous or macabre. 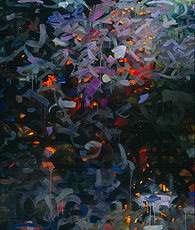 RITA EDELMAN, Hadley, Massachusetts: My paintings suggest rather than define. I make layer on layer of marks . . . a web, if you will. Hopefully the viewer will see layer on layer of meaning. My paintings do not yield themselves to casual scrutiny. They require a few moments of contemplation. I call them "slow release works." My work depends on an intuitive response. Its symbols are ambiguous and are open to multiple interpretations. 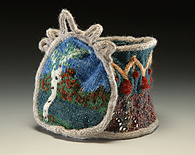 EVE JACOBS-CARNAHAN, Montpelier, Vermont: My passion for knitting is physical, cerebral, and creative. The process provides a calming retreat, a time to organize my thoughts and enjoy the tactile qualities of yarn. The variety of complex patterns and textures that can be created through knitting provides endless challenge. I spin most of my own yarn, giving me full control over my palate: the color, shine, thickness, and style of my yarns. HEATHER KASUNICK, Northampton, Massachusetts: Each day I record information in two ways: in a daily logbook I keep for managing Type I diabetes, and in a book, beside my bed, which consists of lists. These record-keeping activities are inextricably connected to the art I make. I absorb information -- words, sounds, and images -- and record it, or reinterpret it through a specific structure via drawing, collage and painting. I am interested in expressing how parts build or coexist together to make something whole. EVIE LOVETT, Putney, Vermont: Backstage is the basement, a narrow room threaded with water pipes and plastic tubing running from the soda dispenser in the bar above. They come in, the men and one woman...the metamorphosis begins. There is noise in the basement, but for me, looking through the lens, thinking in black and white, all is silent. What pulls me in is this intense focus, the "off" before the "on," the private before the public. Anything seems possible in these moments -- liberation, transformations, even perfect beauty. ROBERT McBRIDE, Bellows Falls, Vermont: The focus of my work is color -- Color as painting, Color as sculpture. Creating the work allows me to translate much of the stimulation -- visual, audio, emotional -- that I take in from living into tangible forms. I liken the creation of my work to a conversation. 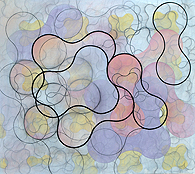 I approach the blank surface with a vocabulary -- line, color, form. I have no set idea what I want the completed work to look like. As I commit myself to the work a rapport develops between the painting and me. SUSAN PRINCE THOMPSON, Wilton, New Hampshire: The special language of the map is a complex abstraction: graphic representations of the natural features of the landscape, which is then overlaid with multiple signifiers. Both physical and conceptual constructs we humans have devised to modify and apprehend how our environment is represented. Thus we can read into the map a wide spectrum of meanings from the most personal to the political. on canvas, 72" x 62"
MIA SCHEFFEY, Brattleboro, Vermont: My work is about the exploration of line, color and form as a visual language, giving expression to an unconscious world of feelings or events. It is for me like music: a non-verbal language of emotion. My drawings and paintings are no longer about rendering what I can see and know, but about discovering something previously unknown to myself, or unfelt. They are not about the thing, but the energy of the thing, the excitement of the new perception. CRAIG STOCKWELL, Keene, New Hampshire: I made a (late) commitment to painting; I believe in finding more by digging in one hole. 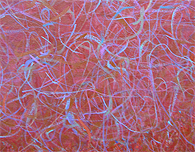 I'm interested in discerning painting as a language and understanding, referencing, and nudging the current vocabulary. Stop by the Museum between now and February 5 to see this exhibit. Admission is FREE on Gallery Walk nights.